I was delighted to discover this new book from Toni Jordan because it’s a departure from her two previous romantic comedies, signalling that Jordan is an author who’s interested in experimenting with different styles of writing. I enjoyed both the Miles Franklin longlisted Addition and Fall Girl (see my review) but Nine Days is historical fiction with cross-over into the present. Like the ‘rom-coms’, it also tackles social issues. Nine Days is a poignant exploration of the ties that divide and bind communities, and of social mobility. The story is set in Melbourne’s Richmond, now gentrified as it never was in the 1970s when I was a frequent visitor there to see Aunty Gwen (who wasn’t my aunt.) Jordan has captured perfectly not only the streets and lanes, the pubs and the massive factories such as Bryant and May’s but also the strong ambitions for social mobility among Catholic families. In the days when the school leaving-age was only 12, it was staying on at school that made the difference. Getting your Merit Certificate in Form 2 (Year 8) meant a better job, maybe a trade; getting your Intermediate (Form 4/Year 10) meant a white-collar job in insurance or banking. Beyond that meant the professions: getting your Leaving certificate (Form 5/Year 11) meant you could be a teacher or a nurse*, and getting your Matriculation certificate meant you could go to university if you could win a scholarship too*. But finding the money to keep the children at school was a struggle for fatherless families. The Widows’ Pension was introduced by John Curtin’s Labour government in 1942 but that was too late for Kip, who introduces the story in 1939, four years before the school leaving-age was raised to 15. It was also too late for his sister Connie, who had to leave Art School and char for her mother’s boarder, the irascible Mrs Keith. Ma went out to work to keep Kip’s twin brother Francis at school, but she could not manage it for both boys. Education for Connie was never a possibility: Ma’s ambitions for her daughter meant marrying ‘up’ and out of Richmond and into leafy Hawthorn. I like the way that Jordan has not romanticised community life in a suburb like Richmond. Her characters struggle to be ‘respectable’ in a place where others were not and had no ambition to be. The divide between these sub-cultures is represented by the gang which terrorises Kip and his brother well into adulthood, and by the inescapable gossip which can so easily trigger a fall from respectability and the end of any hopes of ‘moving up the hill’. In Jordan’s novel it seems to be women who are most alert to shades of respectability. These layers of respectability are partly identifiable by the number of children in a family, but also by domestic arrangements such as the use of table napkins and brands of crockery, or the wearing of gloves and hats. Mrs Husting’s hostility towards Kip when he takes up work for her husband as a stable hand is overt. Sneering down at him from her upstairs window, she uses the pretence that she cannot see him to make extremely rude remarks about him. Kip’s mother is terrified of gossip and, tragically, takes what she thinks are necessary measures to ward it off. The theme of constraints on the lives of women in this period is lightly sketched but unmissable, especially in the contrast between the 21st century choices available to Charlotte and Stanzi. As in her previous novels, Jordan has a fine ear for dialogue. Each character has a distinctive ‘voice’ which is consistent with era, gender, and personality. But when I get back to the wall in Mary Street, they’re not there. Maybe I got the place or the time wrong, or they’re not going to come at all and it’s their idea of a big jape. And then I see them turn the corner, walking casual as you like, with bags over their shoulders. I lean on the wall straightaway. I nod. ‘Hope we haven’t kept you waiting, Frankie,’ says Jim. Jordan also inverts expectations about the war as a major backdrop to the novel. The story begins just as ‘that Mr Hitler’ is generating concern in faraway Australia, and there are allusions to the pressures for and against enlistment, as well as to rationing but this story is more about families and the connections between them across generations. 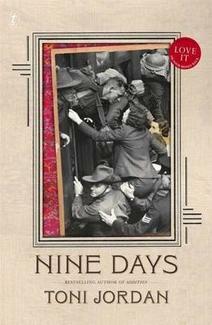 To reveal much about that would spoil the reading for others, so I’ll confine myself to recommending Nine Days as most enjoyable reading, that would be a fine choice for book groups. *I’m not sure when bursaries/studentships were introduced, but I know people ‘of a certain age’ who won Education Department teaching bursaries some time in the 1940s. Commonwealth Scholarships were introduced by the Menzies government in 1951, but prior to that there were philanthropic scholarships as there still are today. Examples that I know of are the Caroline Kay scholarship set up in 1894 or the music scholarship that enabled my music teacher Valda Johnstone to attend the Conservatorium in the 1930s. To find out more about Toni Jordan, see Meet an Aussie Author. Sue at Whispering Gums enjoyed it too. PS I will be discussing this book with the author at [Untitled] the Stonnington Literary festival on November 17th, click the link for more details. Or direct from Text Publishing, including as an eBook. Oh, excellent review Lisa … I like your comment that “I like the way that Jordan has not romanticised community life in a suburb like Richmond”. This aspect of the book reminded me very much of Ruth Park’s Harp in the South. Jordan seemed like a writer to watch with her first two seemingly light books, and this one has shown that she certainly is. BTW Never having gone to writing school or even thought about how I might write fiction, I hadn’t thought about the writing school cliche you mention. But, you make a good point — this is expertly done! Yes, I thought of Ruth Park too – only what’s so impressive is that while Park *lived* the life she was describing, Jordan has been able to recreate a world that was gone before she was born. It was as if she was channelling Aunty Gwen! Oh yes, of course, you’re right … Park did actually live in that area of Sydney didn’t she. Jordan did do a wonderful job of evoking the period. I keep hearing great things about this book and now your review has convinced me to add it to my reading pile. Thanks Lisa! HI Natasha, I think that as a writer yourself you will appreciate her mastery even more. It is just so well done. I’ve just finished Nine Days and loved it! She’s got such a great knack for writing a novel that is so easy to read, yet is still intellectually stimulating and has some beautiful writing in it. I loved the way Connie’s character is created by all the others first, before we have the chance to see into Connie’s mind. Now I’m going out to buy Jordan’s other titles too. Thanks for the recommendation! I just finished reading Nine Days yesterday, and loved it. A nice, easy read, after finishing Bring Up the Bodies by Hilary Mantel. Now onto another Australian novel Engagement by Chloe Hooper, which is reminding me of The Collector by John Fowles. I’ve read big family sagas set in London but never one set in Melbourne, which from this side of the world seems a novel take. Sounds like this one takes account of social history so is doubly interesting. “Respectability” seems to have been a dead-duck since the 1960s when it became uncool to be too conforming. No doubt it continues with vigour in various communities. Perhaps we have just changed our view of what is acceptable. HI Tom, yes, I think you’re right. The trouble with the old notions of respectability was that there was a different idea of what respectability was for men and women. It was ok for men ‘to sow their wild oats’, but a woman who had a baby out of wedlock was a ‘fallen woman’ or worse. It was ok to swear in pubs or workplaces and women were excluded from these places because ‘they might be shocked’. A man could get drunk or enjoy a decent Scotch, but a woman had to make do with limp shandies, and woe betide her if she had too much to drink, her reputation was ruined forever. And women who went out at night on their own or wore revealing frocks were asking for it, because respectable women did not do these things. Now, while I see all kinds of behaviour that I don’t like much, at least that kind of gender-based hypocrisy is largely gone. I have this one out from the library at the moment and I am really looking forward to reading it. I haven’t actually read Jordan before, although I have intended to! Oh you *must* read Addition and Fall Girl, you will love them! I’ll read it but right away, I’m waiting for its price to go down a bit. It’s good to know Toni Jordan tried something else (not that her two previous novels were alike), I’m curious about this one too.